Enjoy 3 nights in Prague as you explore the city with a local guide before you embark on a 7 day river cruise along the Danube from Nuremberg to Budapest. It’s hardly surprising that one of Europe’s longest waterways has so many wonderful attractions along its banks. Even so, every aspect of this itinerary will surprise and delight. Start with a three night hotel stay in Prague to experience the wonder of this magnificent city, then travel to Nuremberg to embark your 5-star luxury river cruise. Explore Vienna, with its remarkable array of elegant buildings, or Budapest, one of the most beautiful cities in Europe. You can look forward to enjoying it all from the comfort of a Scenic Space-Ship. Start your journey with a three night stay at one of our luxurious city hotels. Join your local guide on a fascinating city walk and view the famous Astronomical Clock. Later, venture across the world-famous Charles Bridge, commissioned in 1357 by Charles IV. Stroll this magnificent city at your leisure. Situated on the banks of the River Vltava in central Bohemia, the beautiful city of Prague is rich in history and home to some of the world’s most striking architectural wonders. There’s no need to plan ahead – your Tour Director is on hand to take care of everything. Journey by coach to the fascinating Bavarian city of Nuremberg, which dates back to the 11th century. Your cruise begins here, and you’ll get to toast the occasion at this evening’s welcome reception. Choose to explore this wonderful city on foot with your local guide or visit moving WWII sites including the Documentation Centre Nazi Party Rally Grounds, a reminder of the terror caused by the National Socialist regime. Regensburg offers a rich tapestry of experiences, from its medieval Old Town to the Bavarian Forest on its border. Join a guided walk around Regensburg or take a ferry and sail the Danube Gorge to view historic Weltenburg Abbey, where you can sample beer from one of the oldest monastic breweries in the world. Alternatively, take a leisurely cycle on your own to the Walhalla monument with your Tailormade GPS device. Visit the medieval Czech city of Cesky Krumlov and discover its World Heritage-listed old town, or journey to Salzburg and explore the birthplace of Mozart and the city backdrop for the film ‘The Sound of Music’. Be guided through Melk’s magnificent 18th century Benedictine Abbey. Alternatively, embark on a guided bike ride along the river from Melk to Dürnstein – at your own pace, of course. Or visit a local winery for a guided tour and tasting of its fine wines. As the day ends, take in the fine views of the breathtakingly beautiful Wachau Valley. Take a guided tour of historic Bratislava or tour Schönbrunn Palace and witness the opulence of the Habsburg Empire. Alternatively, explore this majestic city on a guided cycling tour or visit the Belvedere Museum, one of Europe’s most stunning Baroque landmarks. Discover the greatest collection of Austrian art dating from the Middle Ages to the present day, complemented by the work of international artists such as Claude Monet and Vincent van Gogh. The museum houses the world’s largest collection of Gustav Klimt’s paintings, including the golden Art Nouveau icons ‘The Kiss’ and ‘Judith’. Admire the opulence and luxury of Palais Liechtenstein while enjoying a glass of fine Austrian Sekt. Then sit enthralled during an enchanting private Viennese evening concert featuring the timeless music of Strauss and Mozart. Make the most of a guided city tour including a piano concert, or discover the Jewish heritage with an expert local guide. Alternatively, take a guided hike to Buda Hill for breathtaking views over the Danube, or journey to nearby Szentendre, known for its museums, galleries and artists. You’ll have the opportunity to discover this charming town on a guided city tour. Depart after a wonderful farewell breakfast. Budapest is the end of your cruise, but it will be the start of a lifetime of wonderful memories. Please note: Pre release itinerary subject to change. On this 13 day combined cruise and tour, discover the gems of the Danube from Budapest to Nuremberg before arriving in the Bavarian City of Munich. 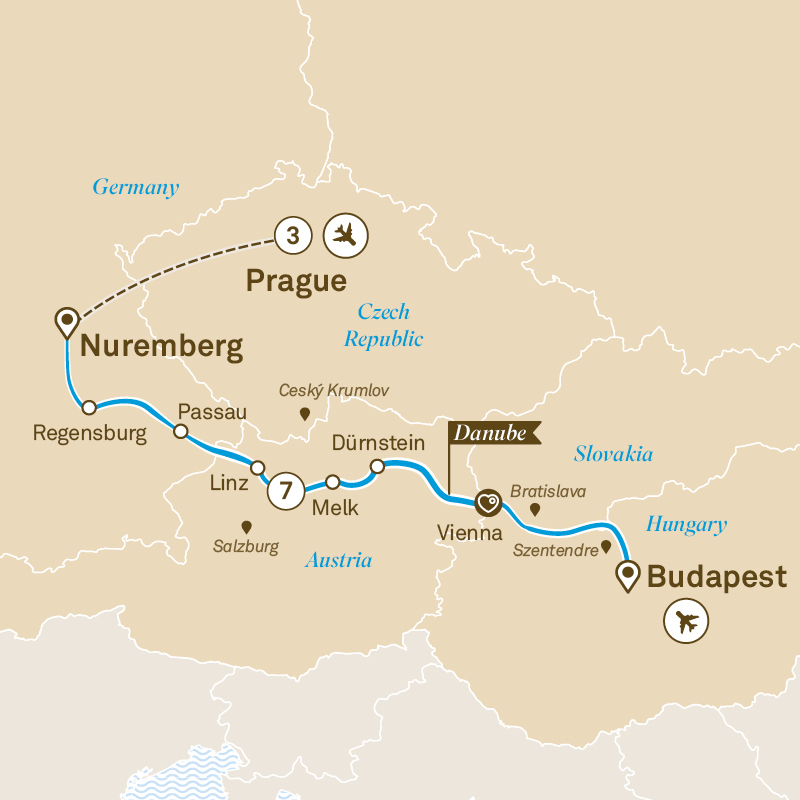 From Bucharest to Nuremberg, cruise along the Danube river through the spectacular Iron Gates. Visit Belgrade, Osijek, Budapest, Vienna and Regensburg.